The kids in town practicing their stand-up technique. More important four adult instructors on the mat. Bodes well for the Pukekohe class. We just got to keep the numbers up. Great turnout. Plus we have more kids moving up from the beginners soon. Recently we found out that one of our parents, Geraldine, takes interesting photos. Thought we might put a few up for you. Kids putting out the crash mat for throwing practice. It always makes us laugh (on the inside) seeing them organise themselves to move the crash pad. We get them to throw fast on the crash pad so they can practice turning their heads and rotating their upper bodies. without hurting each other. 'Men (and women) O Wat' prepping for the senior class. Adult Judo is a bit tougher than the kids. It is nice seeing the team come in early and be around though. It lets them know that Judo training is life long and to approach it like a marathon rather than a sprint! Spare suits and the first aid kit! Two essentials for any club. As my instructors used to say 'There is no learning without pain" and the juxtaposition of the suits and the first aid kit really made me think about how, like life, nothing in Judo comes without hard work and risk. On Saturday night after coaching I was lucky enough to be invited to a party celebrating Rick Littlewood being awarded a Kodokan Eighth Dan Black belt. This is a big achievement. Only one in New Zealand and very few elsewhere. Best of all though it was an opportunity to gather with a group of real warriors. 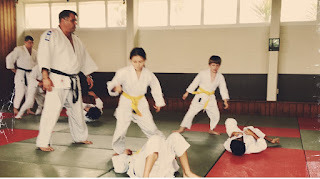 People who have devoted their lives to testing themselves on the Judo mat. We had most of the first group of Kiwis to live in Japan studying Judo, People like Rick, Mike Bond, Ivor Endicott -Davies and David Mair, They set new technical standards and established the networks that made it easier for future generations to travel to Japan and train. 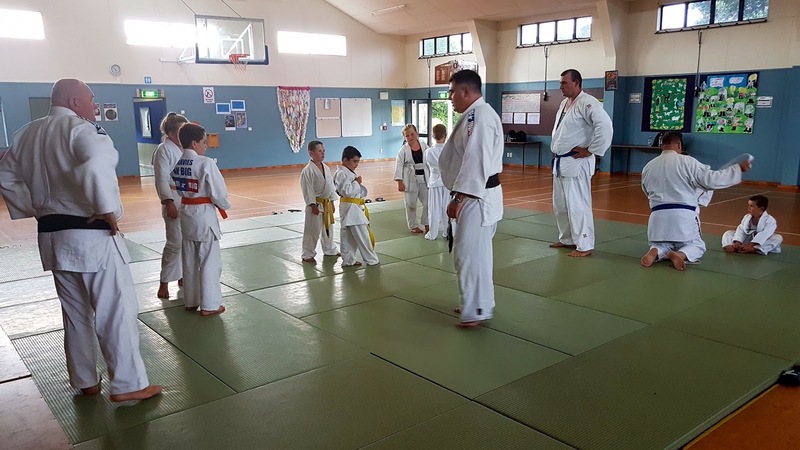 From that base Judo in New Zealand improved and with access to higher technical standards we produced Olympians and Commonwealth Games medalists. 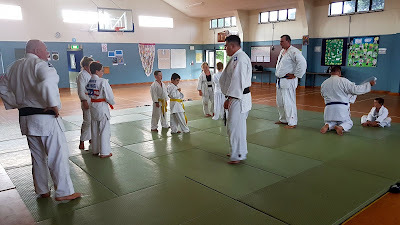 But also in this group are a whole lot of hard, tough Judoka who may not have been international players but learnt from people like Rick and Mike and then fought hard in New Zealand and helped raise our standard. In this photo there are a lot of legends of New Zealand Judo. I'd love to list them all but it would take ages. It was wonderful to be in such good company. We are all go. Adults and kids so get back on the mat! No excuses - and tell your friends!